On my first trip to see the Wateresk portal tomb I had completely forgotten to check out this nearby standing stone. 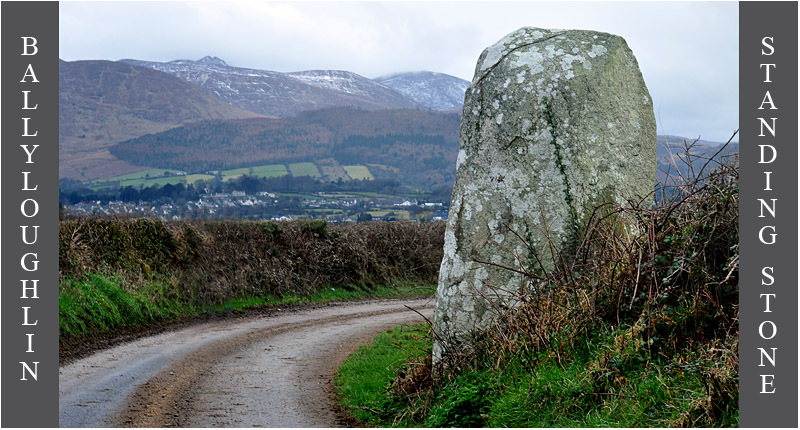 This huge megalith stands at 3.2 metres high and is almost a metre wide. At present it is set into a dry stone wall running along the side of Flush Road. Apparently there is a smaller fallen stone on the other side of the wall, less than a metre away, which I was unable to see. 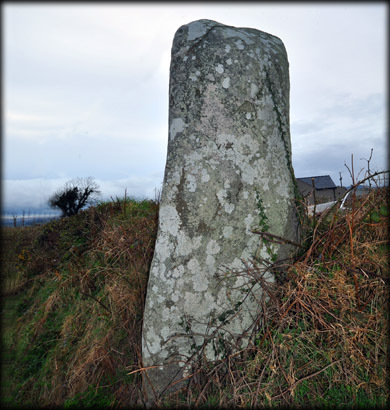 It has been suggested that these two stones are the remains of a megalithic structure. There is reference to a large number of stones in a circle in this vicinity. If this is indeed the remains of a tomb then it is likely to have been a portal stone or maybe a large orthostat from a court tomb. As well as the nearby portal tomb there are several other interesting antiquities close to this location. These include the remains of a church and round tower at Maghera and the late 12th century Norman castle at Dundrum. Situated: Take the A2 north from Newcastle, County Down. After approx 3 kilometres you will see a small picnic area on your left, take the left turn immediately after the car park and take the next left. Discovery Map 36. J 3902 3421. Last visit March 2013.